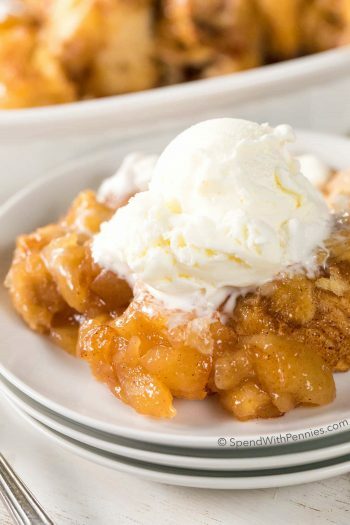 This is not a quick recipe but it is easy and is it sooooo worth every single second! I have to say, these are literally the BEST cupcakes I’ve ever eaten! Ever… and I’ve eaten a lot of cupcakes. 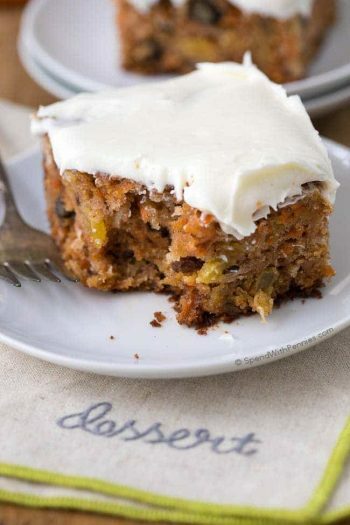 The frosting is outstanding… as in.. you could eat it by the spoonful. Definitely my favorite frosting EVER! When creating the cavity to fill these cupcakes, I like to use a cupcake corer because it’s easy and it’s perfect every time!! Prepare cupcakes according to directions on the box except replace the water with the same amount of coconut milk. Instead of using the mix to create 24 cupcakes, I made only 20. Put the stove on to medium and combine the sugar, water, and corn syrup. (note: make sure you use a pot that will allow the mixture to bubble up when you add the milk) Cook over medium high without stirring until the mixture reaches a dark amber color. Add 1/3 cup coconut milk and vanilla while stirring with a whisk. Allow to cool. With a mixer on high, combine butter & cream cheese until fluffy. Mix in 2/3 cup of the caramel syrup. Add in powdered sugar 1/2 cup at a time until desired consistency. Refrigerate mixture for 30 minutes before using. Using a spoon or a cupcake corer creates a cavity in the cupcake. 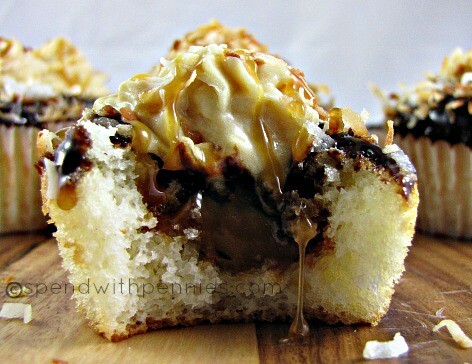 Fill each cupcake with the dulce de leche. Dip each cupcake in the chocolate mixture and sprinkle with toasted coconut. Allow ganache to cool. Pipe frosting on top. 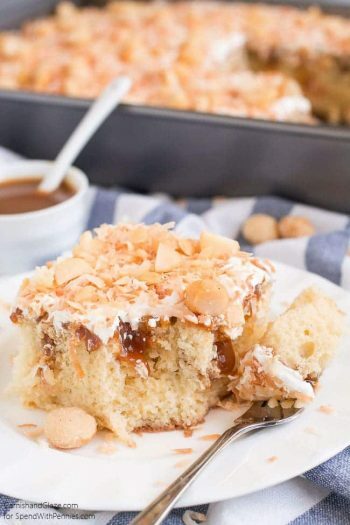 Sprinkle with toasted coconut and drizzle remaining caramel syrup on top. 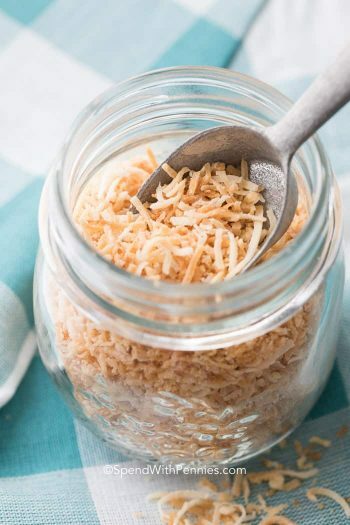 To toast coconut: Place coconut in a frying pan over medium heat. Stir occasionally until coconut turns brown. ©Holly Nilsson for SpendWithPennies.com. Content and photographs are copyright protected. Sharing of this recipe is both encouraged and appreciated. Copying and/or pasting full recipes to any social media is strictly prohibited. Please view my photo use policy here. 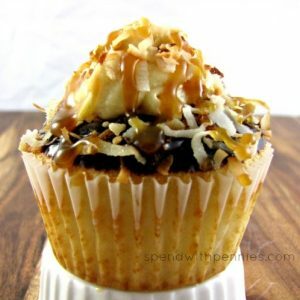 I have seen so many recipes for Samoa Cupcakes! This recipe was slightly inspired by Taste & Tell, with some changes and additions and some of my own recipes (like caramel frosting!!) added in! Ohmigosh, these look so delicious! I am going to have to try these. I’m visiting from the Pretty Life in the Suburbs link party. 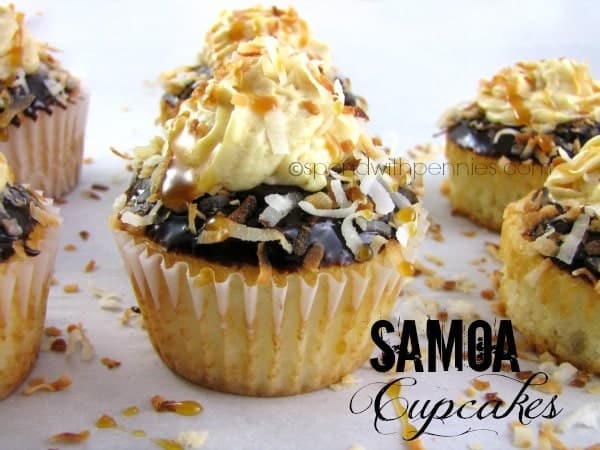 My children lo-ove Samoa cookies and I know they’d love these cupcakes! Thanks for sharing at Inspire Us Thursday. oh man, samoas are my favorite. samoa ice cream? so good. I can only imagine what these taste like, yum!! 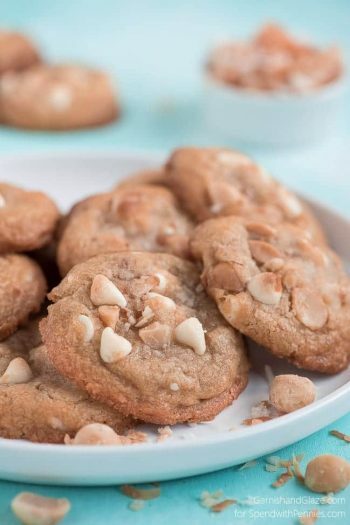 They may not be quick but they look delicious! I love Samoa cookies! It’s hard to imagine them as cupcakes without drooling all over my keyboard! Made these for Father’s Day! They are absolutely fabulous! You were not exagerating when you said they are the best cupcakes you ever ate! They are good!! Be making these again!